I never even tasted finger millet aka ragi before I got married, as astonishing as this fact sounds to me today. Growing up in Ahmedabad, ragi just wasn’t very common, and we never spotted any bags of it on the shelves of departmental stores. Even if we had, I doubt I would have loved the grain then, as much as I do now. I believe ragi is something that needs to be cooked just the right way, for one to fall in love with it, and that is something that my family and I were clueless about then. Post marriage, I was introduced to ragi in all its myriad forms – rotis, dosas, mudde, cakes, and what not. Of course, considering that ragi is staple food in Karnataka. The husband would make a mean ragi dosa some nights for dinner, and that is how my love affair with the grain started. I began experimenting with the grain – and the flour – more and more, slowly realising just how good it is for the body. Now, ragi is a staple in our home kitchen, a regular addition to our grocery list. Today, I am going to tell you about the husband’s style of making ragi dosa, something that I love to bits. Please keep in mind that there are scores of ways of making this dosa, and this is just one way to do so. This is my favourite way, though, so I really hope you will try this out. Take the ragi flour in a large mixing bowl. Add the salt to taste, curry leaves (torn), finely chopped green chillies, cumin, regular dosa batter OR rice flour (whichever of these you are using), asafoetida and curd. Heat the 1 tablespoon oil in a small pan. Add the mustard seeds, and let them pop. Add this tadka to the ragi flour in the mixing bowl. Mix well, adding a little water at a time, till the batter reaches a consistency that is neither too runny nor too solid. Let the batter rest for about 10 minutes. Heat a dosa tava till drops of water dance on it. Then, turn the flame to medium, pour a ladleful of the ragi dosa batter in the centre of the tava, spread it out, spread a teaspoon of oil around it, and sprinkle some of the finely chopped onion on top of the dosa. Cover the dosa with a plate, without disturbing it. Let it cook for about a minute, and then uncover and flip the dosa over. Cook on the other side for a minute. Transfer the dosa to a serving plate. Make dosas out of all the batter in a similar fashion. Serve hot, with chutney of your choice, though these dosas do not really need any accompaniment. Simple, quick and healthy, right? Do you like ragi dosas? Do you make them at home? What is your special technique? This recipe is my entry for the letter R, for the Alphabet Cooking Challenge. It’s eerie how some people have never met you, they’ve just read you, but still seem to have the ability to look into your head and know exactly what you would love. It’s eerie, but it surely feels good. That is exactly how I felt, a while ago, when I received a care package from this sweet blog friend of mine. She told me she wanted to send me a little gift, which stunned me the minute I opened it. It contained a packet of quinoa, one of buckwheat, and one of chia seeds. How on earth did she know that I had been eyeing these very things in the departmental store aisles, but never picked them up? How did she know I was looking forward to cooking with these exotic-to-me ingredients? She did know, though, I don’t know how. One of the things I made with the quinoa was a South Indian-style quinoa upma, inspired by the Curried Quinoa Salad we learnt at the recent Diabetic Masterclass I attended. The upma turns out delish, is loaded with health benefits (thanks to the quinoa! ), and is super easy to make. What more do you need from a dish?! I made this upma for dinner, and it was much loved by everyone at home. Today, I am going to tell you exactly how I made the upma. Take the quinoa in a heavy-bottomed vessel, and add just enough water to submerge it. Cook covered on a high flame, stirring intermittently, till the quinoa is well cooked but still retains a bit of a crunch. Take care not to overcook the quinoa. Add more water in between, if needed. When the quinoa is cooked, switch off gas and drain out all the excess water, if any. Keep the cooked quinoa aside. Heat the oil in a pan, and add the mustard seeds. Let them pop. Add the asafoetida and dry red chillies. Let them stay in for a second or two. Add the ginger. Fry for a few seconds. Now, add the onion, carrot, peas and capsicum. Add salt, turmeric powder, red chilli powder and green chillies. Add just a little water, cover and cook on medium flame till the veggies are cooked, but not overly so. Add the quinoa and the sambar powder. Mix well. Cook on medium flame, uncovered, for 4-5 minutes, stirring intermittently. Make sure the quinoa does not stick to the bottom of the pan. In between, check for seasonings and add red chilli powder or salt if needed. Switch off gas when everything is well incorporated. Add in the lemon juice and finely chopped coriander. Mix well. Serve hot. The upma doesn’t really need any accompaniment, but you could serve it with a chutney of your choice if you want to. Make sure the quinoa is well cooked, but not overdone, otherwise the upma will turn soggy and tasteless. The only way to do this is to cook the quinoa in a closed container, opening the lid to check on it periodically, till it is done just right. You can add any other vegetables of your choice to the upma. I added whatever veggies I had in my kitchen at the moment. This upma is inspired by the recipe for Curried Quinoa Salad shared with us at the Diabetic Masterclass I attended a while back. I have made several changes to the original recipe, to suit my family’s palate. Do let me know in case you need the original recipe, and I could e-mail it to you. This is an entry for the Alphabet Cooking Challenge, for the letter Q. Do you like the sound of this recipe? I hope you will try it out, and that you will like it as much as we did! What do you do with quinoa, in your kitchen? Tell me! I’m all ears! When I learnt, recently, about Orange Kheer, I knew I had the dish that I wanted to make for the Alphabet Cooking Challenge, for the letter O. Oranges and kheer – does that sound like a weird combination? It did to me, initially, but when I had read up a whole lot about it, it didn’t sound so weird after all. Oranges are called Komola Lebu in Bengali, and hence, this sweet dish is popularly known as Komola Lebur Kheer. It is traditionally made the same way we make rice kheer or poha kheer, by cooking milk constantly over a low flame, reducing it to more than half ot its original quantity. Newer versions, though, are quicker and easier – they include the addition of cream or condensed milk to thicken the milk faster and add greater taste. I made the kheer last week, the traditional, long-winded way, and all of us at home loved it to bits. It turned out just beautiful, a lovely way to use those glorious, juicy oranges when they are in season. Here is how I made the kheer. I followed this recipe, mostly. 1. Take the milk in a large heavy-bottomed pan, and place it on a high flame. Let it come to a rolling boil, and then reduce the flame to low. 2. Cook the milk on a low flame till it reduces to less than half of its original quantity and acquires a nice, creamish colour. Stir intermittently, to ensure that the milk doesn’t stick to the bottom of the pan. 3. While the milk is cooking, get the oranges ready. Peel all 3 oranges and separate the segments. Remove all the white fragments and seeds from the segments, and separate the flesh into small portions, using your hands. Keep aside. 4. When the milk has reduced, add the sugar and cardamom powder. Mix well, and cook for 3-4 minutes more. Switch off the gas. 5. Let the kheer cool down completely and come to room temperature, and only then add the orange flesh to it. Mix well. 6. Leave the kheer, covered, to rest for at least 3-4 hours before serving. This allows the orange flesh to infuse the milk with its beautiful flavour and fragrance. You can either keep the kheer in a cool place in your kitchen or let it chill in the refrigerator till you are ready to serve it. This kheer tastes best when made in the night, allowed to rest overnight and then served the next morning. Garnish the kheer with the slivers of roasted almonds. This is an entry for the Alphabet Cooking Challenge, for the letter O. Every time I visit Ajfan Dates & Nuts, that paradise for foodies and bakers, I am awed by the sheer variety of goodies that they have on offer, as well as their uniqueness. More often than not, whenever I go to Ajfan, I end up buying stuff that my expanding waistline begs me not to buy. If you have visited the place yourself, you will know why I get so tempted, why I buy unique ingredients and then think up recipes to use them in. If you have never been to the place, I heartily urge you to do so. (Ajfan has a few outlets in Bangalore, including HSR Layout, Frazer Town and Jayanagar). The last time I went to the wonderland that is Ajfan, recently, I ended up picking up some dried small oranges in sugar syrup that tasted just fantabulous – with a hint of bitter from the rind, the natural sour of the oranges, and the sweet from the sugar syrup. The OH and I began snacking on them, rather unhealthily, a couple at a time. So, I decided that I had better do something with them before we exhausted all of them. Dried small oranges from Ajfan – gorgeousness! Inspired by the recipes for ‘dessert pizzas’ and ‘warm desserts’ that I read about recently, I decided to use these oranges to make some warm Nutella pizzas. That way, I would also be using up the bottle of Nutella that I bought some time ago. Two mangoes at the throw of a single stone, you see? The Nutella pizzas came out fabulous, I must say. All of us loved them to bits – we gorged on them like anything, and I am sure I’ll be making more of them in the times to come. I made four different variations of the Nutella pizza: Orange & Nut, Cranberry & Nut, Banana, and Orange. We liked all of them, honestly, but my personal favourite was the Cranberry & Nut. The OH loved the Banana one the most. Here’s how I made the pizzas. When the oven is ready, toast the bread slices at about 160 degrees for 10 minutes. Spread one tablespoon of Nutella on one side of each slice of bread. Lay them out on a plate, Nutella side up. Spread out the grated cheese on three of the bread slices, above the Nutella. Get the bread slices out of the oven, and assemble the pizzas instantly. For the Banana version, garnish with some slivers of roasted, salted almonds. Serve immediately. I served this as is, without the almonds. For the Orange & Nut version, layer some chopped dried oranges and roasted, salted almonds over a bread slice with Nutella and melted cheese. Serve immediately. For the Cranberry & Nut version, layer some dried cranberries and roasted, salted almonds over a bread slice with Nutella and melted cheese. Serve immediately. For the Orange version, spread some chopped dried oranges over a bread slice with Nutella and melted cheese. Serve immediately. You like? I hope you will try these out, too! This is an entry for the Alphabet Cooking Challenge, for the letter N.
I happen to love Ajfan and the goodies they have on offer. I write about the place here, simply because I would love for you to visit it, too. I don’t stand to receive any kind of gain by recommending Ajfan to you. The views expressed herein about the place are entirely my own. If you have pizza dough handy, you can use it to make these pizzas. I didn’t, so I used bread instead. The Nutella and the cheese are integral components of this pizza, I would say. Apart from that, you can use any sort of toppings that you like. Just get those creative juices flowing! More kali aka more koozhu – that delicious confection consisting of curd chillies, curd, curry leaves and rice/wheat flour – is one of my favourite things to eat, especially if it has a brownish, slight crust that comes from adding a whole lot of oil. I never learnt how to make this traditional South Indian delicacy in spite of liking it so much, till yesterday – I always thought it was something way too difficult to make. This more kali has opened the door to many more more kalis, in the times to come. Here’s how we made the more kali. Mix the wheat flour, cut green chilly, sour curd, water, salt to taste and curry leaves (torn, using your hands), in a large mixing bowl. Make sure everything is well mixed together, and that there are no lumps. Heat the oil in a heavy-bottomed pan, and add the mustard seeds. Let them splutter. Add the asafoetida and let it stay in a couple of seconds. Add the curd chillies and fry them, turning the flame down to medium, till they start turning black. Now, turn the flame down further, and add the wheat flour mixture to the pan. Cook on low flame, for a 4-5 minutes, uncovered. Ensure that you keep stirring constantly, so that the mixture doesn’t stick to the bottom of the pan. You might see some small lumps forming in the mixture initially, but don’t worry about them. Just keep cooking and stirring, and you will be fine. Cover and cook for 6-8 more minutes, or till the wheat flour begins to look cooked and the mixture begins to come together. It will take you 10-12 minutes for the mixture to cook well. Open cover and stir intermittently. Switch off the gas when the mixture is thoroughly cooked. In between, you might want to add more oil if you feel it is getting too sticky to handle. Serve hot or cold, as per your preference. In the olden days, more kali would be made by soaking rice and then grinding it, post which the ground rice would be cooked with curd. Almost no one makes more kali that way any more, as it is a time-consuming and laborious process. It is quicker to make the more kali with rice flour, instead. My mother often makes it with wheat flour, instead of rice flour, and we like it that way. You need to add a whole lot of oil – say about 12-15 teaspoons – to the more kali if you want it to have a yummylicious crust, but I skipped that. You can add more oil, if you are okay with that. We usually cook the more kali till a point where it is well cooked, but not too hard. If you cook it a little beyond this stage, on a low flame, you can pat it down into a plate, it will harden when it cools a little, and you can cut it into pieces like burfee. Use sour curd to make this dish, for best results. If you don’t have curd chillies, you can use dry red chillies to make the more kali too. The curd chillies add a whole lot of flavour to the dish, though, and I would highly recommend using them. We use store-bought curd chillies, but you could make them at home too, if you get a lot of sun. If using curd chillies, be careful while salting the dish, for the curd chillies contain salt, too. The curd chillies, when you encounter them while eating the more kali, can be consumed too. You won’t be able to do that if you are using dry red chillies. This is an entry for the letter M, for the Alphabet Cooking Challenge. It has been a year (a year!) since I posted for the Alphabet Cooking Challenge, I just realised. Shameful, definitely. I have definitely been cooking a lot, but haven’t been focused enough to cook dishes based on the letters of the alphabet, what with a hyperactive toddler, a busy-but-not-busy way of living, and different sorts of ingredients making a sudden appearance in the house and taking over my kitchen, not leaving room for anything else. But then, I am not the sort of person who gives up on something midway, unless it becomes absolutely necessary to do so. So, here I am with the next post in the series – Lemon Poha for L.
Lemon poha happens to be one of the most prepared dishes in our house, specially for breakfast. Everyone loves it, and it is super easy to make as well. Total win-win situation. Now, I am sure there are a whole lot of different ways to make lemon poha, but I am here to tell you how we have always been making it – our family recipe. Place the poha in a colander and wash it well in cold running water. Keep aside for a couple of minutes, for all the excess water to drain out. Then, add the salt to taste and turmeric powder to the washed poha in the colander, and mix well. Keep aside till you are ready to use the poha in the dish. In a heavy-bottomed pan, dry roast the groundnuts on a medium flame till they get crisp. Remove the groundnuts onto a plate, and keep aside. Heat the oil on the same pan. Add the mustard seeds, and let them splutter. Add the asafoetida. Add the roasted groundnuts. Let them stay in for about a minute. Add the washed poha, green chillies, and curry leaves. Mix well. Check for seasonings and add more salt if required. If not required, move on to the next step. Cook on a medium flame, stirring intermittently for 4-5 minutes. Do not overcook it, or the poha has a tendency to turn hard. Switch off the gas and add the finely chopped coriander leaves and lemon juice. Mix well. This is an entry for the letter L, for the Alphabet Cooking Challenge. 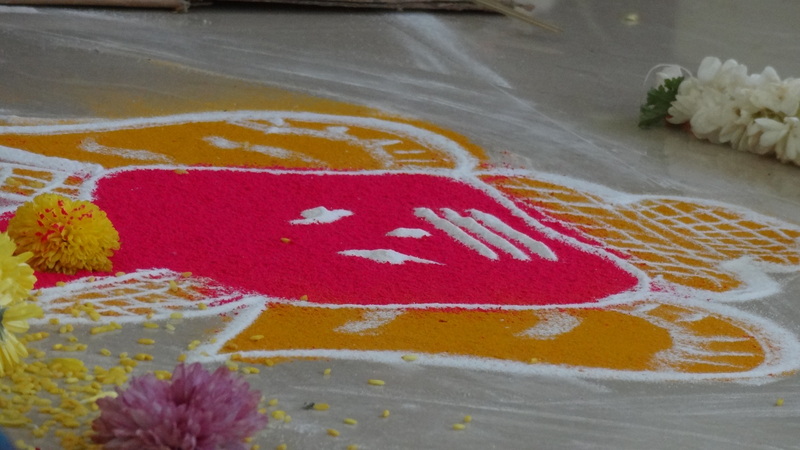 Look at this beauty of a Ganesha rangoli! Remember the Ganesha havan in our apartment that I told you about? The priests made this pretty rangoli for the havan. I am told this is very common in Ganesha havans across Karnataka, maybe even the South of India, but this is the first time I saw something like this. I couldn’t resist snapping a few pictures of it. 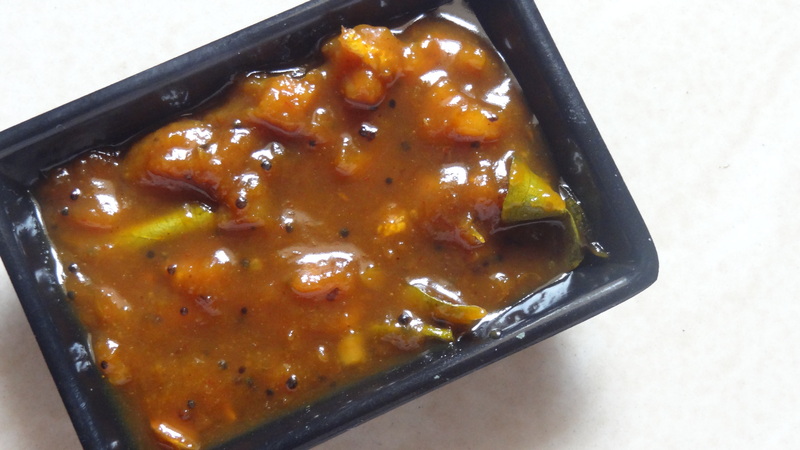 And here is the kotthu kadalai sundal that I made as prasadam for the occasion. Kotthu kadalai sundal – also called konda kadalai sundal – is a common Ganesh Chaturthi offering in South India. 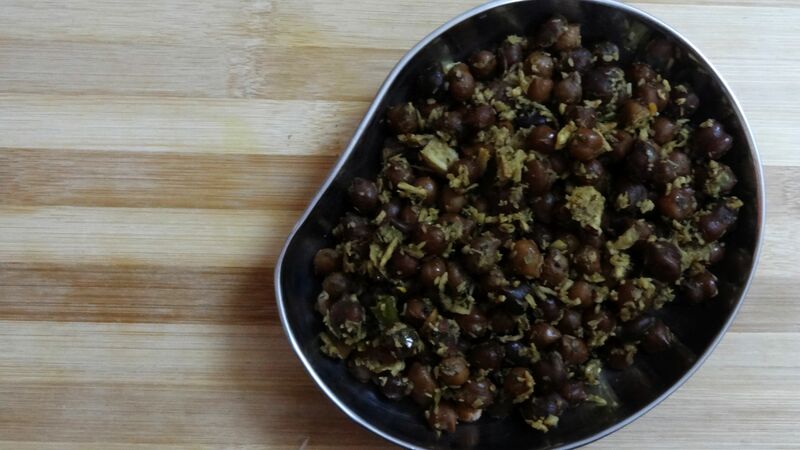 Made using black chana, this dish is super easy to prepare and is very nutritious, too. The basic ingredients used in the making of this dish remain the same, normally, but there are little variations from household to household. I made the sundal we have always made it at home. Heat the oil in a heavy-bottomed pan. Add the mustard and let it splutter. Now, add the asafoetida and the boiled black chana. Let everything cook together on a medium flame for about 5 minutes, stirring intermittently. That’s it! Serve hot or after it has cooled down. What are the variations that you use while making sundal? Tell me all about them! This is an entry for the letter K, for the Alphabet Cooking Challenge. Jalfrezi is yet another dish that I had resorted to always eating at restaurants, which I never made at home just because I thought it would be too cumbersome to do so. Oh, I was so very mistaken! Recently, I had a lot of vegetables and paneer lying unused in the house, and thought of making jalfrezi in my home kitchen, if at all the proceedure didn’t daunt me too much. I found a plethora of recipes on the Internet, most of them quite simple, though. One particular recipe intrigued me – the one from Monsoon Spice. I followed the original recipe to a large extent, making very few and minor alterations, and came up with a delicious, delicious curry that tasted heavenly with home-made parathas. It wasn’t one bit difficult to make. I am so sure there’s going to be no more jalfrezi-eating at restaurants in the times to come. Chop the paneer into large pieces and drop them into a large bowl filled with water. Keep them immersed in water till it is time to add them to the curry. This helps to keep the paneer super soft and fresh. There is no need to fry the paneer cubes. Grind the ginger and garlic together in a mixer, adding very little water. Keep aside. In a heavy-bottomed pan, heat the oil. Add the asafoetida. Now, add the chopped onions. Saute till they are cooked, but not overly so. Add the ginger-garlic paste. Saute for a minute or so. Now, add the beans, carrot, and cauliflower. Add salt, turmeric powder and red chilli powder. Sprinkle a little water, and cover the pan. Cook till the vegetables start turning softer, but not fully cooked, sprinkling more water and stirring intermittently. Add the capsicum, mushroom, green peas, and paneer. Also add the dhania-jeera powder and garam masala. Mix well, but gently, taking care not to break the pieces of paneer. Cook on a medium flame, uncovered, till the vegetables are cooked, but not overly so. Add a little more water if required. Add the sugar to taste, if using, along with the tomato ketchup. Add the kasoori methi. Mix well. If the curry looks too dry, you may want to add a little more water at this stage. Let everything cook together on a medium flame for 2-3 minutes. When the curry is done, add the chopped coriander leaves and lemon juice, if using. Mix well. I made this dish for the Alphabet Cooking Challenge, for the letter J. Ever wondered why ‘Jalfrezi’ is called so? Here is a bit about its history. 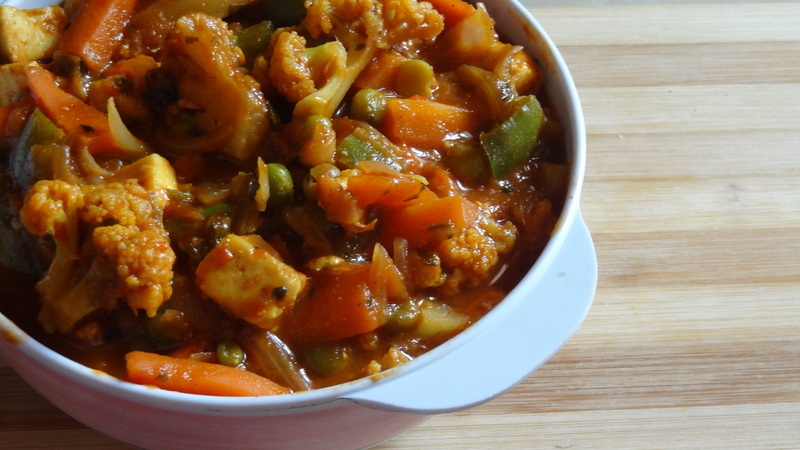 Jalfrezi is the Indian version of Chinese stir-fry made with curry spices. During the Raj, the British created this method of reheating left-overs. You may credit the Governor General for the state of Bengal, Lord Marcus Sandys, who enjoyed spicy Indian foods. He is also credited with converting Tamarind/Jaggery Chutney into Worcestershire Sauce. In Bengal, ‘Jhal’ means spicy hot. ‘Jhal’ became ‘Jal’ over time. Some historians have asserted that Frezi is derived from the Urdu word ‘Parhezi’, ‘Parhezi’ refers to the discriminating of tastes. As the time passed, Indian restaurants adapted the method to make stir-fry with marinated meats. All Jalfrezi dishes have visible: onions, bell pepper, tomatoes, and Serrano. Nowadays, the meats not be leftovers, precooked, or even marinated. You may not use any meats at all, and use different vegetables instead. 3. There are many different recipes for jalfrezi, some more complicated than others. Different restaurants also do it differently. I chose this recipe because I liked the simplicity of it, as well as the sound of it. Now, I think I will stick to it, since I am pleased with the results. 4. You can make jalfrezi with different combinations of vegetables: Only vegetables, vegetables and baby corn, vegetables and paneer, only babycorn, or only paneer. So, I suddenly remembered that I had left the Alphabet Cooking Challenge midway. I decided to pick up where we had left off, and that was at H. A dish for the next letter of the alphabet, I, was promptly thought of and made. Here is how we have always made Inji Puli in our house since generations, which is exactly how I made it now. Soak the tamarind in a little warm water for 10-15 minutes. Then, extract a thick paste out of it, adding more water as and when required, squeezing out all the juice that it has to offer. Keep aside. Heat the oil in a deep-bottomed pan. Add the mustard seeds, and allow them to splutter. Add the asafoetida. Add the chopped ginger. Cook for 3-4 minutes, till the ginger gets a little bit tender. Now, add the tamarind extract. Let it cook on a high flame till the raw smell goes away, stirring intermittently. This should take about 10 minutes. At this stage, add the salt, red chilli powder and jaggery to taste, slit green chillies, and curry leaves. Mix well. Turn the flame to medium. Let everything cook together till the mixture thickens to your desired consistency. Stir intermittently. Let it cool, and fill it up in a clean, air-tight jam jar. Refrigerated, it keeps for about a week’s time. If you do decide to make Inji Puli my way, do let me know how it turned out. I’d love to know! The OH had suggested some time back that I make Horlicks Burfee for the letter H, for the Alphabet Cooking Challenge. I made it immediately, but didn’t get the chance to put it up on my blog till date. Gah! The burfee turned out well, just like mysore pak, though I was horrified at the amount of ghee that went into it. Not something to be had while you are dieting, for sure! I used the recipe here to make the burfee, and followed it to the letter. I will reproduce the recipe here, just for the sake of reference. 1. Heat 1 tablespoon of ghee in a kadhai and add the gram flour. Fry it till it begins to emit a nice fragrance, and starts turning a darker brown. Take the gram flour in a plate, and let it cool down completely. 2. Mix the Horlicks into the gram flour. Ensure that both powders are thoroughly mixed together. Keep aside. 3. Take the sugar in the pan and add enough water to submerge it. Keep the pan on a low flame, and let the sugar and water heat up. Let the sugar syrup come to one-string consistency. 4. At this stage, add the Horlicks-and-gram-flour mixture to the sugar syrup, stirring constantly to ensure that no lumps are formed. Keep the flame medium. Keep adding the ghee to the pan little by little, stirring continuously. Continue this process till the ghee starts to separate out from the mixture. Switch off the gas. 5. 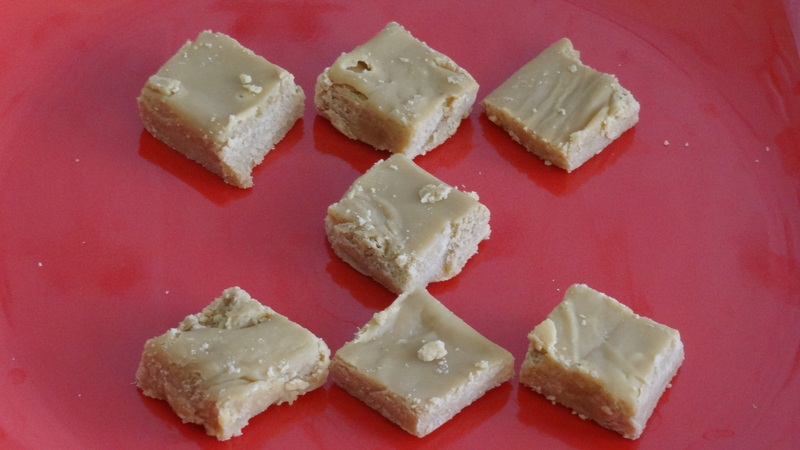 Keep a greased plate ready to pour the burfee mixture into, as you continue to stir it. 6. Transfer the burfee mixture to the greased plate as soon as you switch off the gas. Let it cool down completely. Cut into pieces at this stage.